Hybrid ceramic bearings have traditional 52100 steel or Stainless Steel rings with ceramic silicon nitride (Si3N4) balls. In addition to being excellent electric insulators, hybrid bearings have a higher speed capability and will provide longer service life, lower friction and a lower level of energy consumption than all-steel bearings in most applications. Ceramic hybrid bearings are widely used in electric motors, aerospace applications, performance racing, high temperature equipment, under water applications and more. 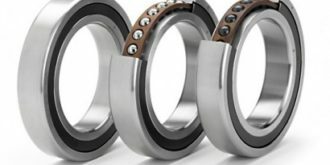 At Ortech we offer a complete range of hybrid bearings with silicon nitride (Si3N4) ball, including Deep Groove Ball Bearings, Angular Contact Ball Bearings and Insert Bearings. All Ortech bearings available with Dry Film Lubricant coating as a result this coating helps reduce friction and abrasive wear. It provides intermittent dry lubrication and is not affected by dust or dirt.